First off, this book doesn't use the same Bible translation that I use. Was it a problem? NO. There wasn't an age range listed but I would have liked my children to read it so maybe 12 & up. You read it, then share with your family but be warned, they may want a copy of their own. Max Lucado can see the profound in the mundane. For example, he writes of sitting by the pool at a hotel while writing and watching two girls with their father. A father and his two small daughters are at play. He's in the water; they jump into his arms. Let me restate that: one jumps; the other ponders. The dry one gleefully watches her sister leap. She dances up and down as the other splashes. But when her dad invites her to do the same, she shakes her head and backs away. I would see a family playing, he sees a "living parable!" and relates it to us ignoring our faith. As we sit there watching, we're urging the girl to jump. Her father will catch her and she'll have fun. What we don't see is us, standing there, being too cautious because we're fearful. Where is our faith in our Father? Jump, He won't let us down. 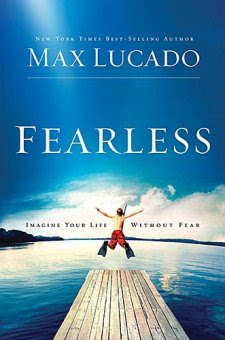 Max Lucado takes each of our fears, relates it to the 'real' world, walks us through them, gives us scriptures to hold on to, and brings us out the other side with a stronger faith and the tools to live without fear. "Don't be afraid," he said. "Take courage. I am here!" And then the author goes on to relate a personal experience to fit this. In this case, it is being given a ride in a fighter jet. How could this possibly relate? Quick and overly simplified: As he is up in the air, he must concentrate on the back of the pilot's head because of his reactions to the flight. The pilot was the one with the experience so he's the one he's going to watch. Isn't our pilot Jesus? We can keep our eyes on "our pilot" during the turbulence of our flight/life. After all, He is the one with the experience. Each of the chapters has a discussion guide at the end of the book. Each discussion guide is divided into three sections: Examining Fear, Exposing Fear and Battling Fear. Read through this book, just as you would a novel then go through it again with notepad and Bible. Get out your highlighter and really read this book. You'll be glad you did. content warning this is a Christian-based inspirational book.